This is my second trip to Boston since the event that happened last April 15. In fact, it has only been two visits more than in the last 5 years when I first set foot in this great historic city. But just like any trip to a place, the itch to walk and give the city a whirl with several hours of foot trekking was an inevitable one to scratch. So we did. With Linnor and Jerry, we moved out of the hotel during rush hour and visited Copley Square where a unique monument for victims and at the same time support for Boston was temporary in place. 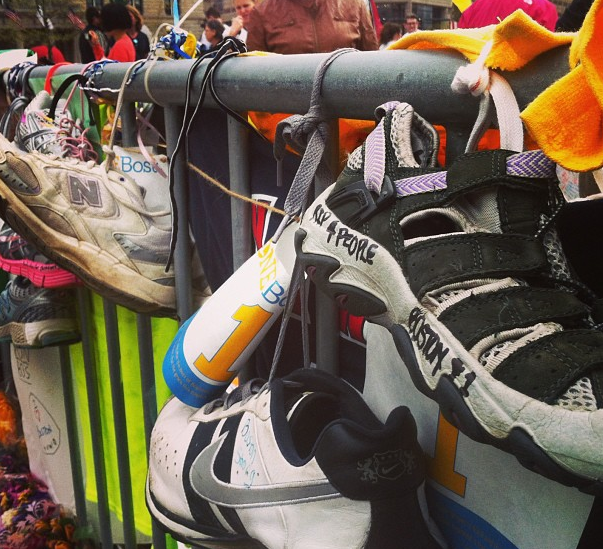 It was somber and poignant at the same time to see sneakers and running shoes hung as a wall of support to the families of the victims. It was also a show of solidarity for most of those who left a part of themselves - a flag, a candle, flowers, - to give to those who gave a lot of themselves - a bad experience, a limb more so - losing 3 innocent lives. Boston - not Sob! Be Strong!